Campfire Mountain Homes is a small duplex and single family home complex in Keystone Real Estate. 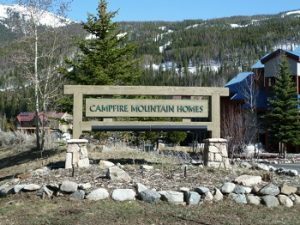 Built in 1998 there are a total of 14 properties in the Campfire Mountain Homes subdivision in Keystone, Colorado. The complex is comprised of 13 – three bedrooms and 1 – four bedroom, the three bedrooms range in size from 1975 – 2546 square feet and the four bedroom is 3188 square feet. All residences have an attached 2-car garage. If you are looking for a spacious Keystone home within walking distance to the Keystone Ski Resort, Campfire Mountain Homes are a must see in the Keystone CO Real Estate market. River Run Village and the Mountain House base area are also within walking distance to these homes for sale in Keystone CO. These homes are in an ideal location in Keystone without the cost of owning a property in River Run, there is no transfer tax or neighborhood fees when you own a Campfire Mountain Home. Just imagine relaxing in your hot tub on your private deck while enjoying ski area views. If you have been considering Summit County Real Estate and aren’t sure where to look, let us assist you in finding the right mountain property.